Have you ever fallen prey to the office cold? It’s no surprise if you have. When it comes to catching a cold, your office is one of the main “danger zones.” In fact, unless you regularly travel via public transport, your workplace is probably the riskiest area. The reason is simple: people. Colds are spread from person to person. The more people you mix with, the higher the risk of getting a cold. But how can you avoid the office cold without shunning everyone you know, and becoming a recluse for the fall and winter? Be wary of shared equipment! You’re probably not going to get sick because Gerry in accounting sneezed in your face. You’ll likely get sick because you touched the same door handle, keyboard, printer, or trash can as Gerry, and countless other people. Should You Go to Work With a Cold? When people are showing symptoms of the office cold, get out of the infection zone as soon as you can. The more people that have been ill in your office, the more germs will be lingering around, so avoiding them is crucial. And the best way to do this is to physically remove yourself from the area! So, work remotely if possible. This is also a good tip if you are starting to feel unwell yourself. It will reduce the chances of you infecting others, and by getting away from everyone else’s germs for a spell, you can speed up your own recovery. If you’re watching people struggle on at work while battling illness, encourage them to do the same – go home and recover. 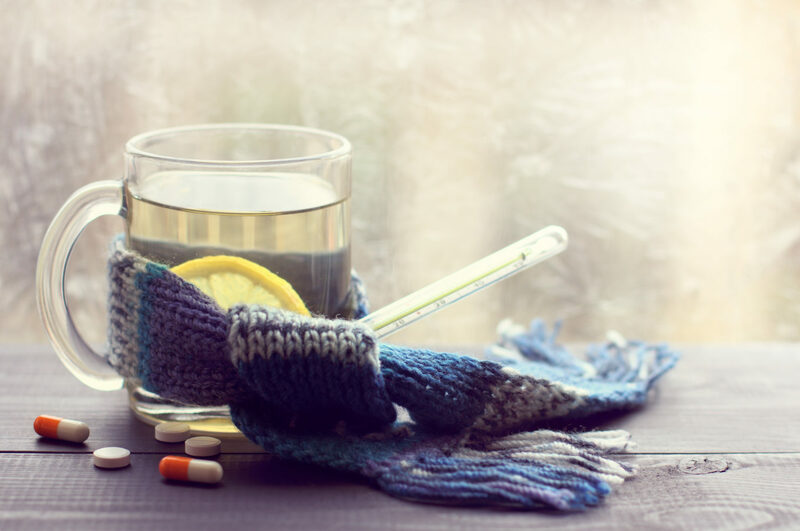 During cold and flu season, it’s wise to manage your team’s work so that if one or two people call in sick, it won’t negatively affect workflow. This way people can take the time off that they need, guilt-free. And it can help to reduce sick leave overall. Fresh air is one of the best remedies for the office cold. Most of us spend our days cooped up inside, breathing recycled air – and plenty of germs. It’s a recipe for trouble. To combat this, get outside as much as you can. Take a walk at lunchtime, or regular “air breaks” every hour. Staying healthy is possible even during cold and flu season – you just have to put some effort into caring for yourself. This includes getting enough good quality sleep and keeping stress levels low. You could try using stress management techniques such as meditation or mindfulness. It also means eating well (research suggests that vitamin D is particularly important) and staying hydrated. And don’t forget about good old exercise. Studies have shown that of all the possible cold remedies, exercise is one of the best, and the most reliable. It may not be your favorite 30 minutes of your day, but if it means you don’t have to spend a week in bed coughing and sneezing, with a sore throat, it’s worth it, right? If your mom ever told you to “wrap up or you’ll catch a cold,” she wasn’t wrong. According to research, staying warm prevents the cold virus from replicating successfully, and encourages the release of enzymes that fight it. All in all, keeping warm in the cooler weather is a tip worth following. Good hygiene can stop you from catching a cold. This means vigorous hand-washing, and zealous use of sanitizer. But it’s also things like using tissues and covering your nose and mouth when coughing and sneezing; and then back to hand-washing. And avoid touching your face and eyes during cold season, as these areas are very vulnerable to infection. Good hygiene should apply all year round, but if you know you’re a little lax sometimes, now is the time to take charge. Colds and flu have some common symptoms, like coughing, sneezing and a runny nose. But everyone experiences illness differently, so think about the warning signs for you. Do you get unusually tired, for example? Or perhaps you experience dizziness, or find it difficult to concentrate. Be on the lookout for your own warning signs, and act on them. For example, you could take a preemptive sick day before you get really ill, or change up your food to get all the nutrients you need. What steps do you take to care for yourself during cold and flu season? Share your ideas below, and let’s stay healthy this winter!